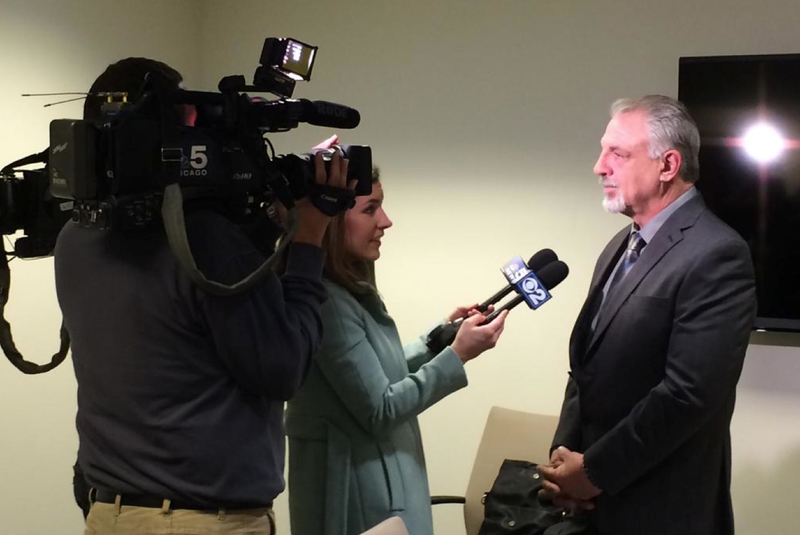 Springfield resident Tim Mercier interviewed before he testified before the House Human Services Appropriations Committee on April 1 against Gov. Bruce Rauner’s proposed budget cuts to Illinois mental health services, explaining how those services helped turn his life around. (Springfield, IL) – Governor Bruce Rauner’s proposed budget cuts to Illinois mental health care services would be a blow to job seekers and aggravate the burden on local and state law enforcement officials, says a top mental health advocate. In Fiscal Year 2016, Rauner is aiming to slice $82 million out of the $459 million in state dollars for the Illinois Department of Human Service’s Division of Mental Health, a 18% cut, according to Illinois Alcoholism and Drug Dependence Association C.E.O Sara Moscato Howe. Statewide, the Governor’s proposed budget cut would mean 7,473 individuals would lose access to mental health care, according to Illinois Alcoholism and Drug Dependence Association. Funding for Illinois mental health care has been cut 32% by the legislature since fiscal year 2009. Howe says that by further cutting mental health care funding even more Illinois residents will go without needed care. Of the 1.53 million Illinois adults having ‘any mental illness’ in the previous year, more than 57% did not receive mental health treatment, she noted. Howe also warned that the reduction in funding for mental health care services treatment services would undermine employment opportunities. Howe pointed out that a 2004 randomized trial studying employer costs found that consistently-employed patients in an enhanced depression management program had 8.2% greater productivity and 28.4% less absenteeism over two years than employees receiving ‘usual care’. Moreover, the reduction in absenteeism and increase in productivity had an estimated annual value of $2,601 per full-time equivalent employee. Howe also said that youth in Illinois are at high risk for mental illness and suicide and more than a third are going untreated. Meanwhile, Howe also spotlighted the alarm bells once again set off by Cook County Sheriff Tom Dart who said on April 7 in a media interview that jails are becoming “dumping grounds” for those struggling with mental illness. Dart estimates that roughly 30 percent of the 9,000 inmates at the Cook County jail have some form of mental illness. The sheriff is also warning that the $82 million budget cut to state mental health service proposed by Governor Bruce Rauner will only aggravate the problem.